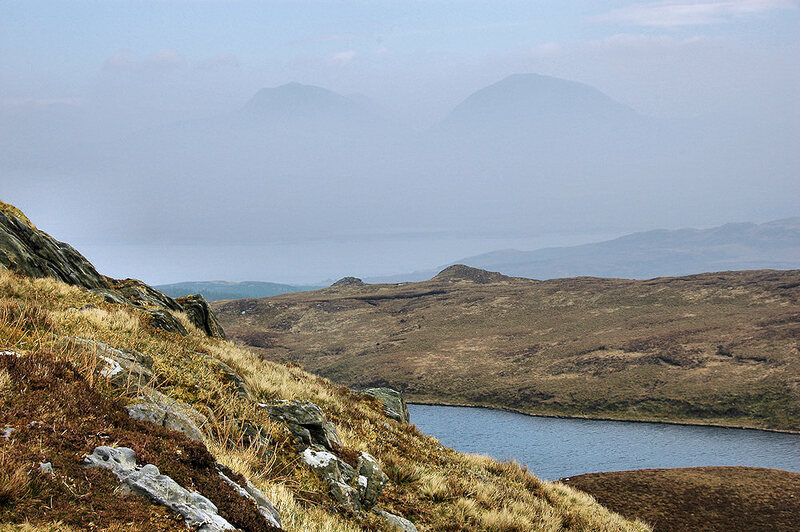 A panoramic view of Giùr-bheinn (318m) and the surrounding landscape in the north of Islay on a hazy day in April 2007. Loch Giùr-bheinn just visible on the right behind the hill. Bunnahabhain and the Sound of Islay hidden by the haze in the distance. If you look closely you can just make out the tops of the Paps of Jura appearing above the haze. A view from Giur-bheinn taken during an Islay walking week a few years ago. The Paps of Jura only just visible in some low lying haze, mainly the summit visible above the haze.